View the latest status of the ozone layer over the Arctic. Satellite instruments monitor the ozone layer, and we use their data to create the images that depict the amount of ozone. Watch a movie of the daily progression through a season or the annual progression of the means for a month. A table of all ozone movies are available in our multimedia section. Ozone is a colorless gas. Chemically, ozone is very active; it reacts readily with a great many other substances. Near the Earth’s surface, those reactions cause rubber to crack, hurt plant life, and damage people’s lung tissues. But ozone also absorbs harmful components of sunlight, known as “ultraviolet B”, or “UV-B”. High above the surface, above even the weather systems, a tenuous layer of ozone gas absorbs UV-B, protecting living things below. The Dobson Unit (DU) is the unit of measure for total ozone. If you were to take all the ozone in a column of air stretching from the surface of the earth to space, and bring all that ozone to standard temperature (0 °Celsius) and pressure (1013.25 millibars, or one atmosphere, or “atm”), the column would be about 0.3 centimeters thick. Thus, the total ozone would be 0.3 atm-cm. To make the units easier to work with, the “Dobson Unit” is defined to be 0.001 atm-cm. Our 0.3 atm-cm would be 300 DU. An ozone mini-hole is a localized and transient reduction in total ozone column amounts, usually found from the midlatitudes into the polar regions. In a mini-hole, ozone is not destroyed as it is in the Antarctic ozone hole. Instead, the ozone is both horizontally and vertically displaced by the dynamics of the atmosphere. The mini-holes are usually associated with weather systems and the jet stream, and occur from late autumn to early spring. The polar vortex is a region in the stratosphere that is contained by the strong jet stream that circles the pole. The vortex spins up in the autumn as the winds increase and then breaks up when the winds die down in the spring. Inside the vortex is a coherent air mass that is colder and that has a chemical composition that is substantially different from the air outside of it in the midlatitudes. What is a stratospheric warming? A stratospheric warming is characterized by an increase of temperature in the lower stratosphere by 10’s of degrees. The warming is forced by large-scale waves that propagate upward from the troposphere. Associated with the warming is a change in the polar vortex structure. The vortex can be displaced off the pole or split into two parts. The last warming of the season is known as the final warming and the polar vortex is rapidly broken up and dissipated. The latest false-color view of total ozone over the Arctic pole. The purple and blue colors are where there is the least ozone, and the yellows and reds are where there is more ozone. 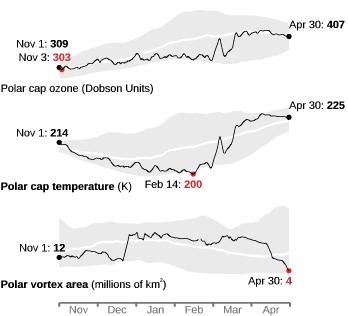 The graphs above show the progress of the polar vortex for the. 2018/2019 season. The gray shading indicates the highest and lowest values measured since 1979. The red numbers are the maximum or minimum values. The polar vortex guides the distribution of ozone and temperature in the Arctic stratosphere. The data for the polar vortex area, the polar cap temperature, and the polar cap ozone are available.